Teach at Media Arts Center San Diego’s DIGITAL GYM! We are currently seeking instructors to assist with our Teen Producers Project, Youth Media & Tech Camps, One-on-One training, and Offsite Youth Media Workshop Residencies. MEDIA ARTS CENTER SAN DIEGO (MACSD) is seeking a Media Educator to assist in the delivery of programming for our popular Teen Media and Tech programs. The ideal candidate is outgoing and enjoys community-based work with multicultural youth, has previous teaching experience, understands the elements of quality media production along with the working knowledge in bringing those elements to life through film and various forms of new media. Equally important is this person’s ability and commitment to keep learning, experimenting and documenting how new media, creativity, and education can come together for the long-term social benefit of young people. In collaboration with other MACSD staff, you will be teaching innovative new media to youth ages 6-19. The emphasis will be on you creating lifelong learners and empowering young people to create quality media arts projects. Media Arts Center San Diego promotes access to film and video as tools for community self-expression and social change and supports the professional development of media artists. 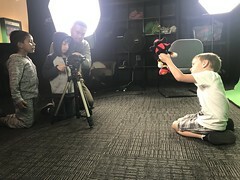 Media Arts Center San Diego endorses the inclusion of underrepresented communities in the media arts field and the portrayal of accurate images of these communities by mainstream media and promotes community access to and use of media technology.